NEW YORK (CNNMoney.com) -- Want to get an extra early jump on this year's holiday must-haves? Take an exclusive look at what products Google says are already burning up the Internet 14 weeks before Christmas. Google was among the earliest to predict last year's Zhu Zhu Pets toy craze after spotting an explosion of searches for "Zhu Zhu Pets" on its search engine a full three months before Christmas, according to the folks with the company's retail team. Meet the new Zhu Zhu Pets. Google's (GOOG, Fortune 500) trends spotting tool -- "Insight for search" -- which debuted in 2008, allows anyone to get a broad overview or a detailed snapshot of the most frequent searches in 27 categories nationwide or worldwide in a given point in time. This year's holiday must-haves. Google's trendspotters have already zeroed in on huge search spikes for a few products that could become this year's holiday favorites. In toys, rising searches for Hasbro's (HAS) Nerf Stampede are up over 1,700% over the past 30 days. 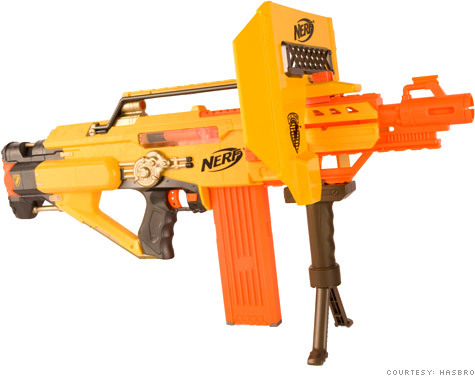 Hasbro unveiled its Nerf N-Strike Stampede Blaster for sale earlier this month, which is the toymaker's latest version of its popular Nerf dart blasters. Searches for rival toymaker Mattel's (MAT, Fortune 500) Sing-a-Ma-Jigs have doubled since July. These are a set of four colorful small plush toys that sing when you press their tummies. They also harmonize their voices with you press all of them together. Silly Bandz quickly became a national craze with kids - and even a few adults - stacking these rubber bracelets shaped like animals on their wrists. But Silly Bandz are relatively easy to buy. Instead, searches for "rare" or "vintage" Silly Bandz that are what's surging ahead of the holiday shopping period. These are the bands that have unusual shapes and colors that are harder to find. Websites dedicated to rare silly bandz such as animalbraceletsblog.com mention such examples as bandz based on Disney characters, sports celebrities, Hello Kitty bandz, and Fantasy Silly bandz. Searches for the popular collectible Japanese erasers called Iwako erasers shaped like cute animals, fruits and vegetables are getting stronger on Google. Searches for "balance bikes" - wooden training bikes for kids - are also spiking, jumping 50% over the last 90 days. In consumer electronics, another hot category with holiday gift seekers, the last 90 days showed a nearly 5,000% increase in searches for the 'Otterbox" brand of cases for the iPhone 4 and a 1,150% jump in iPhone searches. Flip camcorder searches have doubled over last year and inquiries about 3D-ready TVs are 10 times higher. Thrifty trend catching on. Not all of Google's hot trends are product related, however, said Daniel Schock, Google's director of retail industry. Schock said Google's data points to holiday shoppers being even more thrifty this year with their gift-buying budgets. "Consumers are engaged in more comparison shopping this year," he said. "They have become early bargain detectives. They are looking for deals and coupons. Even their search queries Black Friday discounts have become more specific." And with one out of five consumers expected to have a smartphone in hand while hitting stores in the coming weeks, Schock said mobile devices will become indispensable shopping aid this year. "Mobile searches will help with the shopping experience during the busy periods," he said. Many retailers, including Wal-Mart's (WMT, Fortune 500) Sam's Club stores, are responding by making their stores WiFi-ready by November so that holiday shoppers can easily compare product prices, look for coupons and even product availability on their devices without having to leave the store.